Established in 1922, The Foredom Electric Co. of Bethel, CT, has maintained continuous manufacturing operations in Connecticut since 1955. Foredom is the leading manufacturer of flexible shaft rotary power tools in the world. From its flagship line of flex shaft machines, to specialized motors, handpieces and bench top attachments and accessories, Foredom tools set the standard in quality, power and performance. Foredom is one of four manufacturing divisions of Blackstone Industries, Inc. The other divisions are Olson Saw (band and scroll saw blades), Zona Tool (razor saws and other hobby tools), and EFC (plastic finishing equipment). Foredom tools are used in jewelry manufacturing, industrial operations, woodcarving and wood working, dental laboratories, art studios, home/shop hobby applications and nail salons. Foredom flexible shaft power tools are used for many different applications such as hand grinding, deburring, carving, sanding, cleaning, buffing and polishing on all types of materialwood, metal, plastic, glass and stone. Variable Speed foot operated or table top dial controls allow users to find just the right speed for the accessory, material, and application up to 18,000 rpm. Slim, light weight, smooth running Handpieces the vibration, noise, and heat associated with hand held electric or air motors in electric or air tools are eliminated by having the flex shaft motor positioned above and out of the way of the workpiece. The broad and interchangeable selection of Foredom handpieces also adds tremendous versatility to the product line. 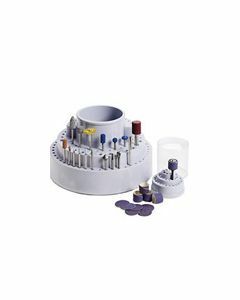 Handpieces are available with either collets or chucks for holding rotary accessories and drills with shanks from 1/16" to 1/4" in diameter. Reliable and Economical flex shaft machines have permanently lubricated, ball bearing, fan cooled, universal motors that are easy to maintain and more economical to operate than air tools. Comprehensive Selection of Rotary Accessories an enormous selection of quality made rotary accessories is available for accomplishing almost any task on virtually any material. In addition to the standard offering of cutters, burs, bits, drills, buffs, brushes, wheels, saws and more, Foredom features several exclusive and unique lines including Typhoon® Tungsten Carbide Burs, CeramCut Blue® Stones, Plated and Sintered Diamonds from Dumont®, and 3M products including Scotch-Brite Radial Bristle Discs, EXL Unitized Wheels, and Trizact and Purple Ceramic bands and Discs.